Darth Vader. 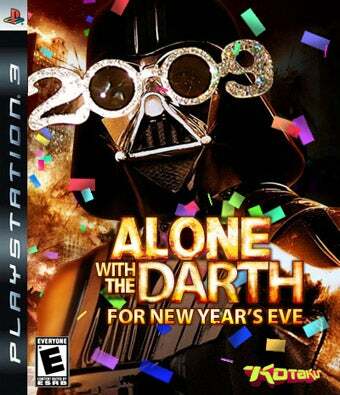 The "Alone With The Darth" boxart has been chosen by Kotakuland as its favorite finalists. Congrats to all who entered and a word about contest hijinx after the jump. We actually had to go through and ban people for getting off topic while voting. If you'd like to discuss what you think of the contest or the prize, fine, but please do that in the contest reminder posts, not in the voting post. Doing that in the voting just gums everything up and makes counting the votes harder. It's not only common sense, but common courtesy. Another thing: Towards the end of the voting, we got spammed with a ton of votes by commenters who had never commented before. What's even more iffy is that the commenters names were written in a similar pattern — like this "NameName." We did not count any votes from first time commenters for any finalists and will not in any future contests. Much love to all who entered — Vader boxart winner, please send an email to kotakucontestATgmailDOTcom to claim your prize. Be sure to include your address. CONGRATS!